This rare Sanibel beach-front cottage is a castle - and it's pet-friendly! This newly renovated beachfront cottage is a rare find on Sanibel Island! It's the most requested rental property in our collection. It's easy to see why! White Caps #6 is our most popular vacation property, having catered to visitors since the 1950s. Don't let the age of this 9-unit compound fool you -- White Caps sits on a prime piece of beach on West Gulf Drive, and #6 is luxuriously appointed and updated with all of the modern conveniences you would want in a beach bungalow. White Caps #6 is 650 square feet of bliss, and it underwent a lovely renovation in August of 2017. It was beautiful before, and is even more so now. White Caps #6 has a living room, dining room, kitchen area that have lovely gulf views, a separate sun room with gulf views, a Master Bedroom with half-bath, a separate full bath and an outdoor shower and charcoal grill. White Caps #6 is the ONLY bungalow with a washer/dryer, dishwasher and full-sized side-by-side refrigerator and stove. The kitchen features gorgeous granite countertops, a stainless steel Kitchen Aid downdraft stove, Kitchen Aid convection oven/microwave, Kitchen Aid French door refrigerator,integrated panel Whirlpool dishwasher and beautiful cabinetry featuring pull-out drawers providing an abundance of storage options. There is an energy efficient Electrolux front load stack washer/dryer as well, and yes, detergent is provided for your stay! There is an island that seats 4 comfortably, along with a workstation/desk area for your electronics to charge with the USB outlet. The cabinetry features boat cleats for hardware, which is the perfect coastal, beachy touch. With Montana Roman Tile throughout, White Caps 6 is light, bright and airy. The living room has an overstuffed sofa and 2 club chairs, along with a 50" flat panel Smart tv with DirecTV Now, Pandora, complimentary wifi and many other apps for your enjoyment. A custom corner cabinet has pewter seahorse cabinet pulls, along with a small MP3 player for streaming music. You can seat 10 people - yes, 10 people, in the living and kitchen area! The new layout is terrific for entertaining! Invite the neighbors over for a cocktail and sunset viewing gathering! The sun room has a Full sleeper sofa, 2 side chairs and custom privacy blinds to shield the sun. The impact-resistant sliding glass doors can be recessed in the cooler months to bring that fresh beach air inside. You can enjoy glorious sunset colors year round in the sun room at White Caps 6. The master bedrom has a Pottery Barn Stratton King bed with storage drawers underneath, lovely Pottery Barn linens, a flat panel Roku Smart tv, closet and a half-bath featuring granite vanity top and sanddollar hardware. Just off of the kitchen is the full-bath, with a single granite top vanity with sanddollar pulls and a shower. Outside, a private shower with hot and cold water is a guest favorite. If you walk another 100 feet outside of the cottage, you're standing on the sugar sand beach, with its beautiful shells and magnificent sunsets. Beach chairs and towels are provided for you. White Caps 6 is 1.3 miles from the heart of the island galleries, grocery, restaurants, shops, theaters and Post Office. There are several lovely restaurants within walking distance as well. 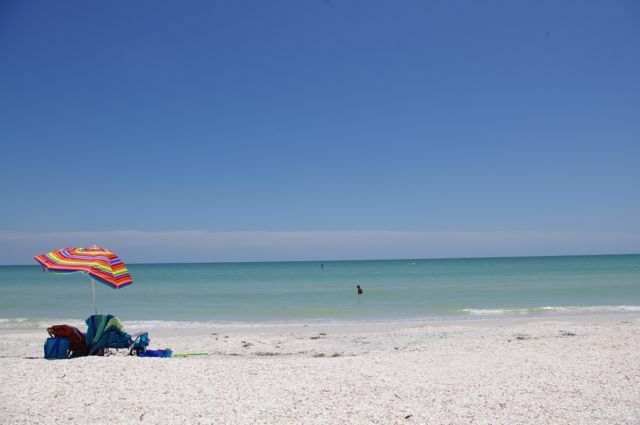 This property is zoned by the City of Sanibel for minimum 7 night rentals. No Exceptions. White Caps 6 is professionally managed by Cottages to Castles. Since 1997, they've been making sure that each stay is a memorable one. Prior to openeing Cottages to Castles, they cared for White Caps #6 since 1983. Outdoor private shower w/hot & cold water. White Caps features a Cordless Phone with Answering Machine, CD Stereo System, Two Cable TVs with VCR/DVD Players, Central Air Conditioning, and Ceramic Tile throughout, it is the only unit at White Caps that offers Plantation Shutter, a Private Washer/Dryer, Full-size Stove and Microwave, Barbecue Grill, Beach Chairs, and All Linens and Utensils, if we do not have it, you will not need it! We DO NOT OFFER a pool or tennis court at White Caps, but, we DO OFFER a reminder of what 'getting away from it all' at Sanibel used to be before it was discovered by the rest of the world! Fortunate to have found quaint little house with view of ocean which is not easy to find on Sanibel. You can tell that owners use the cottage as it is friendly and has all the amenities. Cottages to Castles staff were friendly and efficient. Thank You for choosing White Caps #6 as your home away from home on Sanibel. We are thrilled that the location and amenities met your expectations, and hope that you will return to White Caps #6 should you find yourself in this corner of the world again! Since 1953, White Caps Cottage #6 has been the go-to beach front rental for families for 65 years now - yes, 65 years! The cottage has been thoughtfully updated and renovated over the years, and we are pleased to have represented it for 35 years and counting. Thank you for supporting a local, islander-owned business. We loved having you as a guest, and hope to assist you with your future vacation plans. White Caps 6 is our home away from home. We have called WC6 home many times, most recently for three weeks. It’s a delightful place to stay, with all the amenities. It’s attractively decorated, clean, steps from the beach, convenient to shopping and restaurants, and pet friendly, which is very important to us. Our scottie girls especially love to eat at the Over Easy Cafe and the Island Cow. We always have a wonderful time and look forward to our next stay. Thank You so very much for your continued return visits to White Caps #6. We've been sharing this delightful cottages with visitors since 1982!! While the decor has certainly changed and the amenities have been modernized, the view remains the absolute best, and there is no other place like White Caps! We love that you love your home away from home, and that your doggies do too! The OEC and the Island Cow are two of our favorite places to enjoy a great meal and live like a local. The Over Easy Cafe also owns our favorite pet store, Island Paws. We look forward to seeing you next year. Pack your sunscreen! This was my 7th visit. Always clean, well kept. Very updated. Sharon (manager) takes you under her wing, makes you part of the family. There are so many things to do on the island. It will take me years to see it all. My favorites are Red Rooster Cafe, Bailey's Grocery, and riding on the bicycle paths. There's not enough space to describe how wonderful it is. One just has to experience it. We are so very thrilled that you chose White Caps #6 as your home away from home for so many years! We've been offering White Caps #6 for rent since 1982, and I agree 100% that there is just so very much to experience - from sunrise on the beach with a cup of coffee, to encountering wildlife up close - they have the right of way (!) - collecting seashells, birding, fishing, swimming, meeting new people at the shops and restaurants - and ending each day watching a sunset that is so very different from the one the day before and from what is yet to come. We look forward to your 8th visit, and we're happy to connect the dots for you and make your next stay an even more memorable one. Boy - did the description build this rental up to expectations nothing could ever match. But the price was set high, we dreamed it was true. Our "luxury" sheets were 100% Polyester, the pillows were so lumpy we couldn't use them, one of our handtowels was stolen from Marriot, the cupboards were so crammed with glasses, mugs, etc it was hard to get them out, the shower dial to turn on the water was clear plastic and wobbly, cluttered surfaces full of "decor", lightbulbs were out in appliances... I took pictures of all of this - but VRBO doesn't allow you to post photos. The cottage was pet-friendly - and we loved having our dog with us - but it turns out there are lots of dog friendly places to stay on Sanibel! This unit was tremendously over-priced compared to comparable quality (or better) rentals up and down the Gulf Front of Sanibel. We were paying a lot more per week than our neighbors. Washer/dryer was excellent in unit but some other white caps rentals (among other condos and island rentals) have them as well. Very limited cabinet space and it was full of odd bulky appliances like a "Rotisa-Kebab" machine? No room for a week of groceries. Oh, and the outside shower door latch is broken... the list goes on and on. Access to beach is EXCELLENT. My wife and I stayed here in April 2006. We absolutely loved it! Our islands provide for the perfect vacations. Enjoy 15 miles of unspoiled beaches, 25 miles of bike paths, 50 types of fish, 230 types of birds, 250 kinds of shells and 0 stop lights. Since 1997, our boutique agency has been providing personalized service to help our guests find their home away from home and create memories to last a lifetime. Each year, Cottages to Castles welcomes families and friends from around the world to these idyllic, scenic and tranquil islands. With sandy beaches, worldclass fishing, shelling, bird watching, shopping, galleries, restaurants, live theater – and more – Sanibel and Captiva are your paradise without a passport. Quality and value go handinhand, and we recognize that your vacation time is valuable. We strive to provide you provide peace of mind by providing a level of service and properties that will exceed your expectations. A minimum $200 (per week rented) refundable security deposit, or 10% of the rental rate, whichever is greater, is required to confirm a reservation. This is in addition to the rental rate and is refunded no more than 6 weeks after your departure date. Your doggie is welcome at White Caps #6 with Owner/Association approval and payment of a non-refundable pet fee, plus taxes. Breed and weight restrictions apply. Minimum $200 Security Deposit Required. Rates subject to change without notice. A MINIMUM 7 DAY RENTAL IS REQUIRED by the City of Sanibel- NO EXCEPTIONS. Call for last minute specials and cancellations!